Companies, administrations, public institutions... Many structures require ink stamps on a recurring basis. The manufacture of stamps can be done through various processes. Laser engraving and cutting of rubber remains the most efficient way to produce a quality print, in series or individually. Laser technology ensures a clean and neat result, whatever the medium. Create your rubber, wood or metal stamps using the same machine! Choose the efficiency by choosing the complete Gravograph solution for engraving ink stamps. Stop multiplying suppliers! Gravograph engraving and cutting machines are designed to support you in all your plate-text production projects. Ergonomic and easy to use, our laser engravers are a safe alternative to creating office stamps made of liquid polymer or resin. This long and complex process requires constant attention throughout its many stages. Gravograph laser machines take care of engraving and cutting your stamps for you. Create your stamp with our professional software Gravostyle™, provided with our Laser equipment or other graphic composition software, insert the material plate into the machine, and trust us! Improve your productivity with the speed of execution of our engraving machines, and ensure premium stamp quality! Smoke and debris extraction without fail, thanks to our improved extractors. The working environment remains healthy, and your machine remains clean. An optimized engraving direction: the laser beam is scanned from bottom to top, which allows the smoke to be burned. Rubber is a material that is widely used by professional engravers to make stamps. Flexible and resistant, it offers perfect ink adhesion and allows a perfect print to be made. Rubbalase™ odourless, ideal for limiting sensory disturbances. Our rubber sheets are designed for use with CO2 Gravograph laser engraving and cutting machines. They are available in several formats (contact us). Their technical characteristics are pre-registered in Gravostyle™, the control software developed by Gravograph. This is a crucial step: the creation of the stamp, or its formatting. Gravograph completes its engraving and stamp cutting solution with its unique software on the market, dedicated to managing engraving and cutting jobs. Complete and resolutely user-oriented, the Gravostyle™ software has many functions dedicated to the creation and customization of stamps. Whether you are an expert or a novice, the software adapts to your level! Gravostyle is designed for occasional users. The interactive wizard guides you step by step through the design of your stamp, based on a blank template or template. A few clicks are all it takes to create a standard stamp! The advanced features of Gravostyle™ allow you to create fingerprints using photos, vectors, logos... and to customize them as you wish. The Nesting function automatically places the generated buffers on the material sheet, in order to optimize cutting and save as much rubber as possible to engrave. It allows you to really organize your work! Stamp creation is available from the Discovery level of Gravostyle™. Gravograph tampon machines project a laser beam that melts the rubber gum to the desired depth. The laser prints the stamp upside down so that the text is displayed right side up on the stamped document. 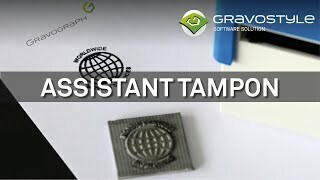 Is Gravostyle™ a software dedicated to stamp engraving? Gravostyle supports you in your creations and offers many other functions, or "Assistants", to simplify your task. The shoulder function ensures that your thin and long letters, such as the "i", remain stable during inking by reinforcing them. The Bridge function facilitates the removal of the sheet of material from the machine, leaving very thin strips of material to connect the engraved stamps to the sheet of material: in this way the different stamps do not remain "stuck" to the bottom of the machine. Many tutorials are available on Youtube. Once your impression has been engraved and cut, insert it into the frame provided by our partner: Colop, or any frame. Make sure your ink cassette is full. Your self-inking stamp is ready to use! If you have engraved your print directly on your substrate, such as a wooden pad, clean the engraving with a Gravograph cleaning solution. Ink it, it's ready to use! What are the Gravograph warranties?